One of the happiest surprises in the recently enacted FY 2018 federal spending omnibus was a significant increase for TIGER infrastructure grants. The always-popular program saw its funding tripled to $1.5 billion. The boost in spending for TIGER was a big part of the omnibus bill’s “down payment” on new infrastructure investment. In late April, the U.S. Department of Transportation released the funding notice for the next round of grants and formally renamed the program. Begun in 2009 as part of the American Recovery and Reinvestment Act, TIGER (Transportation Infrastructure Generating Economic Recovery) is now known as BUILD (Better Utilizing Investments to Leverage Development). BUILD will still function like the TIGER program with annual grants available on a competitive basis. The program also retains its flexibility in both who can receive funding and how they can use it. 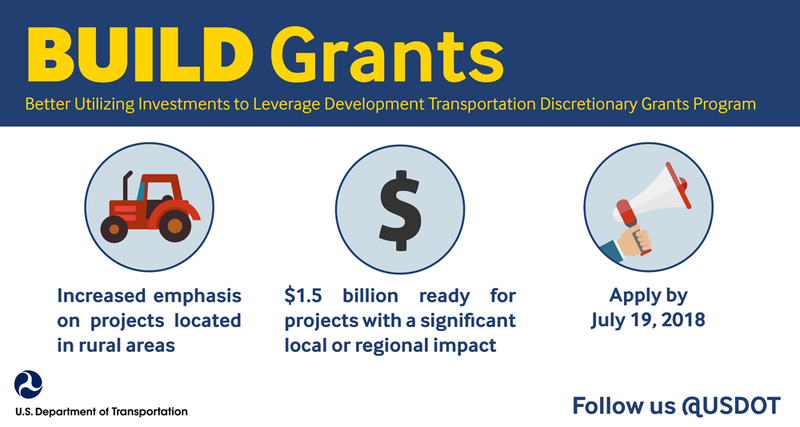 BUILD continues to allow funds to go directly to a variety of local government and transportation agencies and to be used on a wide variety of transportation modes. Like TIGER, the grants are a vital and needed supplement to the traditional formula-based federal transportation funding system. This flexibility was a big part of why funding demand typically ran at about 10 times supply for TIGER. While BUILD looks and acts a lot like TIGER, there are some important changes. The biggest change is the big boost in overall funding. Within the overall $1.5 billion for BUILD grants, U.S. DOT has set aside up to $15 million for planning and design grants. Planning grants have frequently been prohibited under TIGER, so the availability of this funding is welcome news and should help improve the quality of future projects and applications. BUILD grants will be capped at $25 million. With the additional overall funding, the individual grant cap could have been raised in order to better support large, high-impact projects. But Congress kept the maximum $25 million in place. One consequence of that action should be that a lot more projects will receive funding. Perhaps that will help ensure that better balance of funding for transit projects, which fared relatively poorly under the last round of TIGER grants overseen by the Trump administration. One of the most consequential, and controversial, aspects of the shift to BUILD is a new evaluation criterion. U.S. DOT will now consider the commitment of new, non-federal revenue for projects. The Transportation Department has indicated that local or state revenue authorized before January 1, 2015, will not be considered “new” for the purposes of the grant application evaluation. In addition to increased taxes, revenue from things like tolling, asset recycling, and tax increment financing would be new revenue. This is consistent with the approach outlined in the Trump administration’s infrastructure blueprint earlier this year. But it will come as bad news for the dozen states and numerous cities and counties that hiked taxes for transportation infrastructure from 2012 to 2014. Already some on Capitol Hill are registering concerns about the provision. The leaders of the Senate Appropriations Subcommittee on Transportation and HUD — Sens. Susan Collins (R-Maine) and Jack Reed (D-R.I.) — sent a letter to DOT criticizing the move, calling it “unrealistic and detrimental.” The pair could well partner on language prohibiting the move in the next spending bill. The impact of the new revenue criterion, the distribution of grants for transit, and the provision of planning grants will undoubtedly be closely watched elements of this year’s TIGER-to-BUILD process. After getting a late start due to wrangling over the budget, the grant process will move quickly. Applications are due on July 19, 2018. DOT will announce the recipients no later than December 17, 2018. Work is already under way on potential funding for FY 2019 BUILD grants. This week the House Appropriations Committee is scheduled to take up the Transportation-HUD funding bill. This is the first step in the process of setting spending levels and an important moment. Will Congress build on the momentum of funding increases from the omnibus or accept the Trump administration’s proposal to eliminate all TIGER/BUILD funding? The latter option seems unlikely, but the voices of advocates are important to the future of this and other essential infrastructure programs. Top image: Drawing of a variety of modes of transportation. Courtesy U.S. Department of Transportation.